John Marshall served as an officer in the Continental Army from 1775 until 1779, where he became a devoted fan of General George Washington. His admiration prompted him to write a biography of Washington. He became a lawyer in 1780 and was elected to the Virginia House of Delegates in 1782, 1787, and 1795. He was a champion of the Constitution at the Virginia ratifying convention in 1788, earning the gratitude of his hero, Washington. He was appointed one of three envoys sent on a diplomatic mission to France in 1797. Although offered appointment to the United States Supreme Court in 1798, Marshall preferred to remain in private practice. He was was elected to the United States House of Representatives in 1799, and in 1800 President John Adams appointed him Secretary of State. 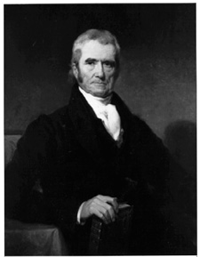 The next year, President Adams nominated him Chief Justice of the United States Supreme Court, and the Senate confirmed the appointment on January 27, 1801. He continued to serve as Secretary of State throughout President Adams’s term and continued in both positions for a brief time following President Thomas Jefferson’s inauguration. Marshall served as Chief Justice for 34 years, the longest tenure of any Chief Justice. With the Marbury v. Madison case, he helped establish the Supreme Court as the final authority on the meaning of the Constitution. Marshall died on July 6, 1835, at the age of 79. "The American population is entirely Christian, and with us Christianity and Religion are identified. It would be strange indeed, if with such a people, our institutions did not presuppose Christianity, and did not often refer to it, and exhibit relations with it."